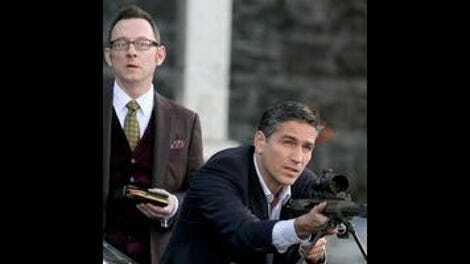 Instead of relying on overwrought cliffhangers and over-emphasized questions to retain its audience’s interest, Person Of Interest doles out answer after answer, confident that the cohesion of this season and the strength of its characters will bring back viewers week after week. It’s clear that there’s a plan in mind, but the real question of the season is whether or not all of the puzzle pieces will fit together at the end of the season. In this episode, it’s revealed that the next phase of Samaritan’s plan involves manipulating a Siri-type voice-activated search engine in order to influence humans’ decision-making. This is another episode where a mediocre case of the week is elevated thanks to seamless ties into the over-arching narrative, but cracks in that ambitious, complex larger story threaten the season-long cohesion that the writers are trying so hard to achieve. When this happens, viewers start asking questions, but not the ones that the writers are hoping to inspire. Efforts at continuity, like the return of Claire and the reference to Shaw, are effective, but efforts at maintaining narrative logic are even more important. Samaritan’s plan has progressed from one phase to the next, but how do they all fit together? It’s nice—in a disturbing way—to see that indoctrination of children through educational technology is still part of the plan, especially with the loaded reference to charter schools included, but how did the experimental phase in Maple lead to VAL instead of the neural implants that were shown, for example? On a character level, is Harold’s ruthlessness towards Claire that surprising at this point, and why would it only be brought on because of Shaw when the team has also lost Carter? There are always going to be nits to pick on a show as complex as this one, but they become all the more glaring as the scope expands and the season endgame begins to come into focus. Issues regarding narrative cohesion don’t diminish the potential of this next phase in the game, however. VAL is a relatively modest weapon, and all the more dangerous as a result. The number’s case of the week isn’t particularly compelling in and of itself, but it does enrich the overarching narrative in an interesting way. Ana’s life is in danger because she’s unknowingly investigating her tech company’s use of VAL to exploit the depressed. By manipulating people’s buying habits through tech, and risking their lives in the process, the company has crafted a psychological weapon. Samaritan doesn’t need to invent some futuristic means of brainwashing because humans had already invented it; people are their own worst enemies because they make enemies of one another. While this new element of the Samaritan arc has potential, an old one returns to again deliver some of the most intriguing and most disappointing material of the season. I’m not going to harp on about the performance issues when it comes to the character of Claire, because they were already covered in the review of “Nautilus” and I don’t want to add insult to injury. I’ll say that the image of her far more successful foil, Root, confronting her with guns a’blazing was exactly what I needed at that given moment and leave it at that. Thankfully, “Q & A” does tap into the rich elements of the Claire character that made “Nautilus” especially thought-provoking, completely justifying her return despite some caveats. 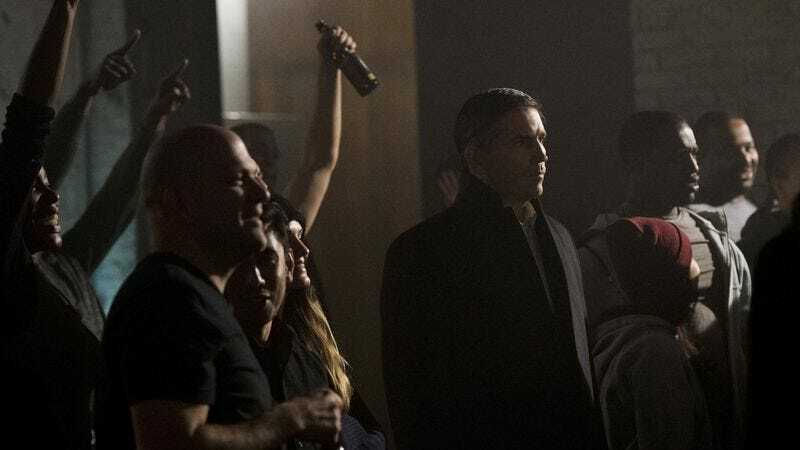 While the issue of suicide is brought up in this episode without being addressed with the depth that the topic deserves, its inclusion ties back to Claire’s history and her importance to the mythology of Person Of Interest. “Nautilus” introduced Claire as a gifted hacker, a talented woman struggling to overcome the death of her parents. She had survived a point in her life where she was on the brink of suicide, only to be recruited into the Samaritan army while she was still in a vulnerable place. That episode was about choice and the ways in which temporary circumstances can distort the recognition of true purpose. Claire is once again an effective personification of these themes here, as she credits Harold with course-correcting her when she was headed down a dangerous path and regrets that this change in direction hasn’t made the right path for her any clearer. Of course, her actual affiliation lies with Samaritan, and Claire even tries to mimic her true savior’s war strategy by trying to recruit Harold to the dark side when he’s at his most vulnerable. Unfortunately, she makes the mistake of conflating physical vulnerability with mental vulnerability, and Harold proves that he has the strength to refuse her offer even in the face of death. Claire’s particular circumstances, choices, and fate continue to be juxtaposed with those of the Team Machine members, and her presence is especially warranted in an episode where a company is preying on the vulnerable in order to make a quick buck. Claire’s fanaticism also parallels with Root’s, and it’s a reminder that those in power of many societal institutions and sects, be they capitalistic or cult-like in nature, have retained their positions thanks to the exploitation of the vulnerable. Unfortunately, some of the actual plotting involving Claire—namely the back and forth regarding her true loyalties—are too predictable for this character, even if she’s more effective as a symbol than the embodiment of a somewhat realistic person. The plotting of the case of the week isn’t much more thrilling in the early goings, as Ana’s issues serve as more of a pit stop before the Samaritan reveal than anything else. His actual motivations have wider implications, but it comes as no surprise that the CFO of the company is involved in the threats against Ana. They writers do try to integrate the number of the week into the ongoing narrative, to mixed results. Any case involving underground female MMA fighting isn’t all bad, but Ana’s sob story regarding her sister’s cancer is more about Reese than Ana’s sister or even Ana herself. When she isn’t working for an evil tech company, Ana is fighting in the ring to escape the reality of watching her sister fight for her life. Once again, Reese’s isolated interactions with a side character reveal the complexities of his psychology—at least this time it isn’t an actual psychologist, lending an ounce of subtlety to proceedings that aren’t so subtle. This strategy worked best with Silva, which is why she’s still my recommendation for Shaw’s replacement, at least for the time being. Scenes like the one between Reese and Harold last week inspire questions as to why the former’s inner turmoil isn’t affecting the latter more, given the potential conflict, rich material, and great performances that intimate scenes between the two bring, but that’s another question that might be answered in due time, as this season ain’t over ’til it’s over. · “Samaritan is hunting us. Let’s hunt them back.” You’re killing me, Claire. Felicity better be on standby because half of me is rooting for Root’s accuracy to improve next time.